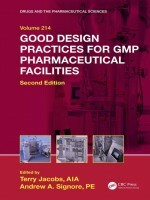 This revised publication serves as a handy and current reference for professionals engaged in planning, designing, building, validating and maintaining modern cGMP pharmaceutical manufacturing facilities in the U.S. and internationally. The new edition expands on facility planning, with a focus on the ever-growing need to modify existing legacy facilities, and on current trends in pharmaceutical manufacturing which include strategies for sustainability and LEED building ratings. All chapters have been re-examined with a fresh outlook on current good design practices.